The TaborT 1700 x 750 Deluxe Whirlpool Bath includes an 11 jet whirlpool system. It comes with a 5 year on site manufacturers guarantee and optimum drain down for hygiene. This system combines 4 side jets 5 back jets and 2 foot jets. The TaborT range has been designed so that it can be used with or without a shower screen. However the addition of a luxurious rectangle shower screen (see additional items) makes this an ideal choice to be used as a showerbath particularly in a smaller bathroom. Materials Specification: Manufactured from 5mm lucite acrylic. Weight: 20.5Kg (not including whirlpool system). Tap Holes: Suitable for tap hole drilling by your installer, comes as standard without tap holes. Waste & Overflow Holes: Pre-drilled. Features: Encapsulated baseboard and re-enforced edges for increased strength and stability. Includes: Legset for easy installation. Excludes: Taps & Waste Kit (see additional items). OPTIONS: Optional Bath Screens are available on this item. Number of Jets: 11 Whirlpool Jets. Jet Position: 4 Side Jets, 5 Back Jets and 2 Foot Jets (PLEASE NOTE: Positions may vary, images are for illustrative purposes only). Pump: Optimum drain down for hygiene purposes. Accreditations: Manufactured in the UK to British Standards ISO9000, quality assured. Also Available: A number of upgrade options, including lights and heaters (see matching items). Please Note: Actual jet, filter and control position may vary. Images for illustration purposes only. No tap holes see description for more details. Bathroom Waste Pop Up ; Push Button Slotted Waste ; Brass Chrome Plug. Shower Hose Standard 1/2 Bore Chrome Stainless Steel Flexible Replacement 1.5m. Bathroom Waste Pop Up Push Button Basin Sink Slotted/Unslotted Chrome Brass. Shower Kit Adjustable Riser Slide Rail Bar Kit Hose Bracket Round Head Chrome. 1700 x 700 Straight Single Ended Bath White Acrylic Modern Whirlpool Upgrade. Whirlpool luxury bath with 11 jet whirlpool colour Changing light bathroom 1800. 1670 x 700 Deep Single Ended Hydrotherapy Whirlpool Bath With 12 Airspar Jets. 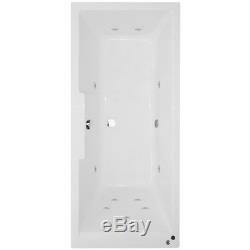 Whirlpool Hydrotherapy Luxury Bath 11 Jet 12 Airspa Inset Round. Well deliver your goods straight to your home and place them carefully in a ground floor room of your choice. We are unable to dispatch orders without a valid contact number. Please provide us with a mobile number as we will update you on the status of your order. Wherever possible, we will deliver your order with our Own Van Service. The sooner you can let us know of any problems, the sooner we can resolve them for you. To organise a return, you must first get authorisation from our customer service team. If you do not provide this information, we will not know who you are and will unfortunately be unable to help. Please Note: These conditions do not affect your statutory rights relating to faulty or incorrectly described goods. For further information about your statutory rights contact your local authority's Trading Standards Department or Citizens Advice Bureau. Bathrooms2Buy provide premium quality, on trend bathrooms at cheap prices. Marking down items in sale, across our large portfolio of products means a desirable bathroom at low-cost. A continuous conveyor belt of the latest, on trend bathroom products pass through our Outlet Store at discount prices; as well as current trend, some of our most popular classic ranges too. Our portfolio covers modern baths, showers, suites, toilets, furniture, basins, taps and more, offering a choice of various styles and sizes to suit your interior home. Designing your contemporary home does not just end with bathrooms; we boast a stunning catalog of the latest on trend Heating, Tiles and Lighting at mark down prices. Be sure not to miss out on discounts and build part of your dream home at an affordable price with Bathrooms2Buy. We also have a dedicated customer service team on hand to answer any queries you may have about a specific product or advice and suggestions on the best products for you. Bathrooms2Buy deliver nationwide to England, Wales and Scotland; we even deliver to Ireland! We have two 100,000+ square foot warehouses! With these HUGE stocks we can ensure that all orders can be processed and dispatched promptly. Please Note that we provide product dimensions as approximate and this should be used for guidance only. 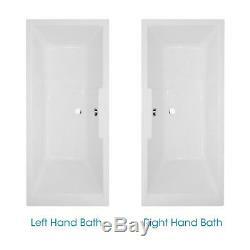 The item "Garland Left Hand 1700 x 750 Deluxe bath 11 Jet Whirlpool Including Legset" is in sale since Tuesday, September 11, 2018. This item is in the category "Home, Furniture & DIY\Bath\Whirlpool/Spa Baths". The seller is "bathrooms2buy*" and is located in GB. This item can be shipped to United Kingdom.